The early 14th-century fortified tower at Longthorpe has been named as one of the 100 most important historic sites in Britain due to its astonishing set of vivid mid-14th-century wall paintings. The history of Longthorpe Tower is the history of the Thorpe family. In the early years of the 13th century, the Thorpes were simple peasants, but they managed to earn enough to purchase their freedom. By the year 1260, the Thorpes had risen up the social ladder to become knights. The family built a manor house at Longthorpe, with a private chapel that became the local parish church. Around 1300 the Thorpes built a fortified tower onto their existing manor. The tower was as much a status symbol as any serious attempt at a defensive structure. The Tower stands 3 stories high, with the main living area on the first floor, storage areas on the ground floor, and accommodation on the second floor. Around 1350 the Thorpes decorated their tower with a series of superb wall paintings that are now acknowledged as among the finest and most complete in northern Europe. Surprisingly, the paintings were covered with whitewash at the Reformation, and only rediscovered during WWII, when a detachment of the Home Guard occupied the Tower. After the war, a tenant discovered more of the paintings, which were then restored in a process that took 3 years. The importance of the paintings was such that the owner, Earl Fitzwilliam, gave the tower to the nation. The paintings give a vivid glimpse into the medieval mind, with a mix of religious and secular themes. Recognisable themes include the Wheel of Life, the story of King David, and the Nativity of Christ. Richly decorated scenes show people from every walk of life, from kings to animals, saints to knights and musicians. There are scenes of country life, heraldic symbols, and a depiction of 'De Tribus Regibus Mortuis', or 'The Three Living and The Three Dead', where a trio of living kings out hunting come face to face with the ghosts of their ancestors. Monstrous figures loom ominously, including one grotesque creature expelling flaming excrement from its posterior! 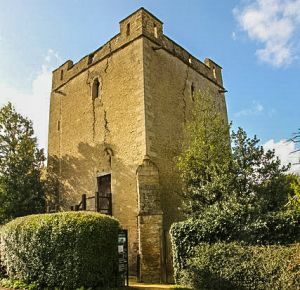 The Tower is owned by English Heritage but managed by a local civic group. Opening tends to be weekends from spring through autumn, with extra weekday openings in summer. Please check the official website for current times.